Cantonese cuisine is considered to be the finest of China's regional cuisines. It was the first style of Chinese food brought to the United States and is what you may be familiar with when ordering at restaurants. There's no need to go out for dinner, though! You can make delicious Cantonese-inspired meals at home with these favorite recipes. Better yet, as long as you have the ingredients, these dishes are pretty easy to make and your family is sure to love them. Beef with oyster sauce is a classic Cantonese dish and a staple at Chinese restaurants. 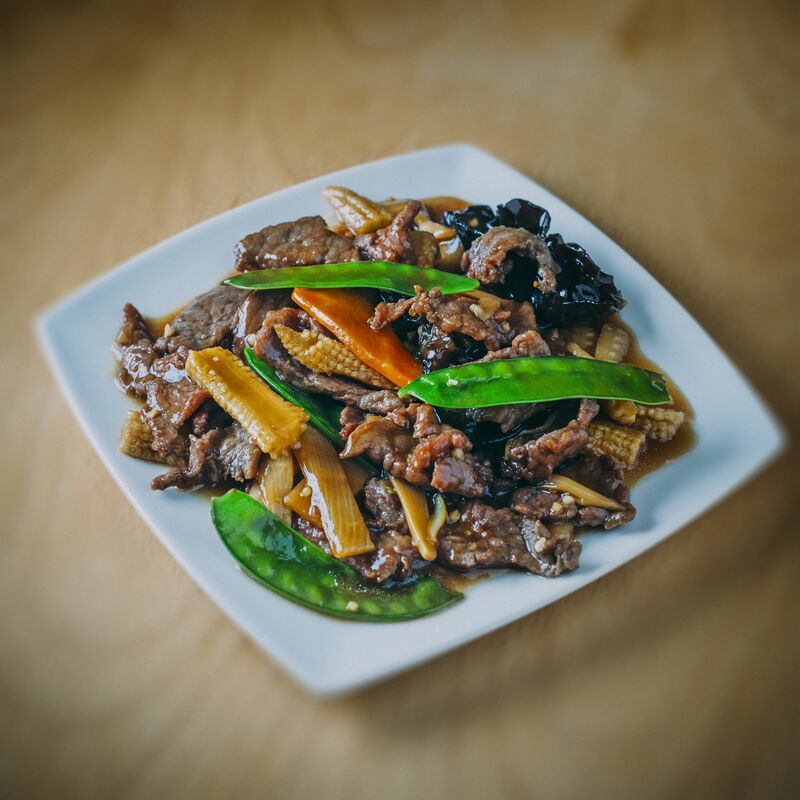 It's simple, featuring snow peas and carrots cooked with beef steak in an oyster-flavored sauce, which enhances the natural flavor of beef. You'll enjoy the simplicity of this recipe: it requires just four ingredients for the stir-fry and another four for the sauce. It's both a fantastic vegetarian dish and introduction to cooking Chinese at home. Cantonese spareribs are world famous. In this recipe, the ribs are marinated in a sweet and spicy combination of honey, hoisin sauce, oyster sauce, soy sauce, and crushed garlic. They're then glazed with honey during baking to create unbelievably ​moist and flavorful ribs. Beef with tomato is a favorite home-cooked dish in the Cantonese region. In it, the tomato is cooked with a beef cut like sirloin or round steaks that have been marinated in oyster sauce. A bit of sugar helps balance the slightly acidic taste of the tomatoes and the stir-fry medley is completed with celery, onions, ginger, and cloves. Enjoy the perfect combination of beef and sweet bell peppers cooked in a savory black bean sauce. Like many of the other recipes, you'll also add garlic and ginger and create a marinade with a few simple ingredients. This one's perfect as a main dish or part of a multi-course meal. Restaurant-style sweet and sour pork is easier to make at home than you may think! Cook up this popular dish with pork tenderloin that's deep-fried twice for extra crispiness. It's then coated with a tangy sweet and sour sauce made with pineapple and ketchup. Salt and pepper shrimp makes an excellent appetizer or main course. The deep-fried shrimp shells turn a wonderful orange color, and have a crunchy texture, while the spicy seasoning adds extra flavor. Leaving the shells on protects the shrimp meat so it tastes very tender and comes out delectable. Not a fan of deep-frying? Try stir-fried salt and pepper shrimp instead. Soy sauce chicken is also called cold chicken because it's served at room temperature or chilled. The recipe utilizes a whole fryer chicken, which is boiled in a seasoned blend of soy sauce, sugar, star anise, and ginger. Your family will love the richly flavored chicken and you'll appreciate how easy it is to make! Delicate flowering chives are often available in the produce section of local supermarkets as well as Asian markets. This delicacy is the main ingredient in the flowering chives stir-fry, a simple six-ingredient side dish. Serve it with prawns or other shellfish, any fish, or simply use it to top a bed of noodles. Cantonese steamed chicken is an ideal recipe that will have dinner on the table in less than an hour! The Chinese dried black mushrooms add an earthy flavor to the chicken, which is also flavored with ginger and onion. Add to that staples for Chinese cooking like rice wine, sesame oil, and soy sauce, then serve it over rice and you're done!